When you dance near elephants, you have to expect a few broken toes. I don't usually remark about rumors, but with Best Buy accidentally posting the specifications of the new Canon EOS 100D, it's not exactly a rumor we're dealing with here. The mirrorless world is now officially dancing in a tricky space with elephants closing in. What do I mean by elephants? 16m+ in unit sales split between two elephants versus 3m+ in unit sales split between six smaller grazers. There may be an 8:1 size advantage between Canon and the biggest mirrorless player in terms of interchangeable lens cameras, probably more when lenses are counted, and certainly more when dollars (yen) are counted. So let's examine what we know about Canon's probable new entry: the EOS 100D is 13 ounces (camera body only), same as the Olympus OM-D E-M5. It's a bit less wide, about an inch taller, and an inch deeper. The EOS 100D is actually thinner than a GH3 (and less overall area). The question is this: how far do you have to reduce DSLR size in order to effectively erase the size/weight advantage of the mirrorless systems? Canon is now fully bracketing the mirrorless models. First, they have a large sensor compact (G1x), second there's the Canon mirrorless (EOS M), and now there's the Tiny DSLR (EOS 100D). At 18mp APS and US$800 for the kit, the EOS 100D looks mighty competitive with a lot of the mirrorless players, yet retains the phase detect autofocus and optical view of the DSLRs. Plus there's all those EF lenses that can mount onto it. While the EOS M didn't make as big an impact on the mirrorless market as the Nikon 1 did, the rapid iteration to the EOS 100D shows that Canon is looking to find the right mix that allows them to protect themselves against mirrorless competitors taking away more interchangeable lens camera market share. I've actually been testing a couple of mirrorless cameras that are ridiculously thin (NEX-6 at 1.5", for example, but that's mostly the grip, as the actual body depth is less than an inch and the same as the Sony RX-100 compact camera). One question we need to answer for a high-end camera is "can you make it too small?" 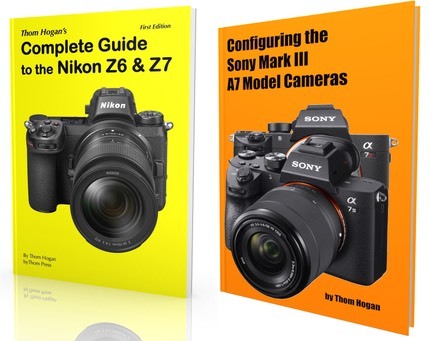 Sony made the right decision with the "fat grips" on the NEX-6 and NEX-7: the camera is small enough that to use it effectively at the eye you need something to grasp in order to retain maximum steadiness while shooting. 16mp+ and shaky is not a good combination, as I've noticed a few times with the RX-100. m4/3 — m4/3 should be okay if they can keep pushing their game forward, in particular with focusing. The primary advantage here is small lenses, and lots of them. The sensor size disadvantage is an overall kit size advantage still, so m4/3 has a marketable position. But defending it just got more critical. All the m4/3 players together don't have the dealer base or advertising budgets of Canon, so they need to market smart. Very smart. Nikon — Nikon's in an interesting position. They already have what's effectively a small DSLR, the V2. It's small, it has small lenses, it can take regular Nikon F-mount lenses and lose very little function, and it already has DSLR focus speed plus it has that at 15 fps. You'd think that Nikon could manage to market that. But now Nikon has an actual small DSLR problem vis-a-vis Canon. That little EOS 100D has Nikon D3200-type of performance, after all, but in a smaller package. Nikon has twisted themselves into a very strange knot. The D3200 is less expensive than the EOS 100D, while the V2 is more expensive (though Nikon just introduced new instant rebates here in the US that changes this a bit). My guess is that Nikon will have to have a more direct response to the EOS 100D, especially if the EOS 100D sells in any meaningful way. But how they rationalize that against their other offerings is going to be interesting to watch. Sony — Lack of NEX lenses is going to hurt them if they're not careful. I warned about this before, but with m4/3 carrying a full arsenal and Canon now attacking with another full arsenal, the lens selection in NEX is again feeling a bit meager. That the EOS 100D and EOS M and the NEX systems have a same-sized sensor means that Sony has no clear marketing position of their own based upon specifications. The easy things to claim, like "bigger sensor" is going away for them. The fact that Sony Alpha DSLRs couldn't make inroads in market share against the Canon and Nikon models should scare Sony: now the elephants are dancing in a turf they thought they might have more time to develop. So what is it Sony? What's the advantage of a NEX? (Please note that I'm not saying there isn't an advantage; I'm not speaking of my personal opinion about their cameras here, I'm asking what their effective marketing response is going to be with the elephant clearly in the room with them.) Of all the participants in mirrorless, I think Sony has the most to worry about with the EOS 100D and M pairing. Iterating more cameras than lenses is going to cost Sony if they keep up that strategy, though. Samsung — With no traction in the market and the elephant in the room, they may get kicked out of the room if they're not careful. Fujifilm — They've gone niche, essentially. They want to be the elephant that kicks Leica out of a different room. I doubt that Canon's plays are mattering all that much to their decision making. Pentax — They're already out of the room (K-01 discontinued, Q totally marginal player, GXR not updated in forever). The question is can they get back in?